Burn videos to Blu-ray disc on Windows/Mac with Blu-ray burning tips. 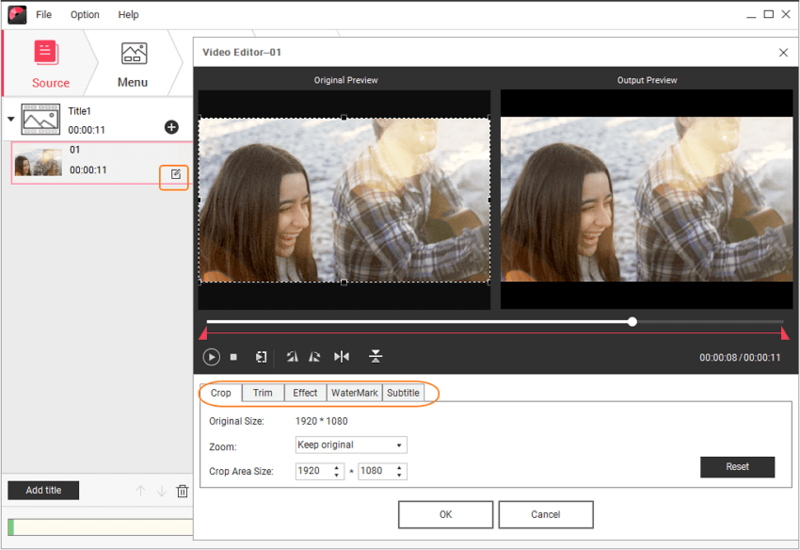 Create Blu-ray videos with editing features like crop/trim/rotate. Customize Bluray videos disc menu with 100+ free menu templates. Additional toolbox including photo slideshow, video editor, DVD copy, etc. The Blu-ray driver gives us more than just the capability to play the motion picture in 3D and HD. The capacity of the storage that comes with Blu-ray allows us to store a high amount of data. As a matter of fact, experts are now saying that the Blu-ray will soon surpass the DVD with the capacity of 4.7GB. It is simply the future of home entertainment. Once you full upgraded your house on the state-of-the-art entertainment, you are now probably thinking if you can introduce that function to your computer and create Blu-ray videos. Fortunately, there is, but we need to consider first the minimum requirements of installing Blu-ray drives to your system. This article will tell you the best way to burn videos to Blu-ray disc, and introduce several useful Blu-ray video burning tips. The first thing you need to look at is the system requirement in order to make sure that your computer has the exact configuration that will support its process. The Blu-ray technology is a step ahead in the technology of your computer. Most probably you will need an additional memory in order to efficiently utilize the Blu-ray writer. And since the Blu-ray is more on the high definition images, you may need to upgrade your video card in order to comply with the requirements. The installation process should also be carefully perused. You might want to consider unplugging the computer first and placing it in an area that has no carpet in order to minimize the amount of static energy. When placing the Blu-ray writer, you should be extra careful and avoid getting in contact with the circuit board as it may damage the electrical component in your system. In case that you are using Mac, you need to have at least Intel Processor or a G5 that has the Operating System of 10.5 or the most recent. The amount of available Blu-ray writer has increased over the years. It now offers the fastest and most effective way to install software, back-up your file or produce a home motion picture that you can burn. If you are planning to purchase a Blu-ray writer you need to highly consider the speed of the writer when burning Blu-ray videos, after all the Blu-ray videos take a large amount of space and it may take some time if you are burning a movie especially if the burner is slow. Some ideal Blu-ray burners that you can purchase would be Pioneer BDR-2209, LG BH16NS40, ASUS BW-12B1ST and LG Electronics BT30N. After choosing the preferred Blu-ray burner, you may now prepare your HD content. Your HD video may come from Final Cut, iMovie, TiVo or from your HD Camera. You should also have a large space free in your hard drive where you can temporary save the file that you need to burn. This way in case that the burning of the file fails, you will no longer have to start from the very beginning. A recordable Blu-ray Media is also needed preferably the BD-R disc. 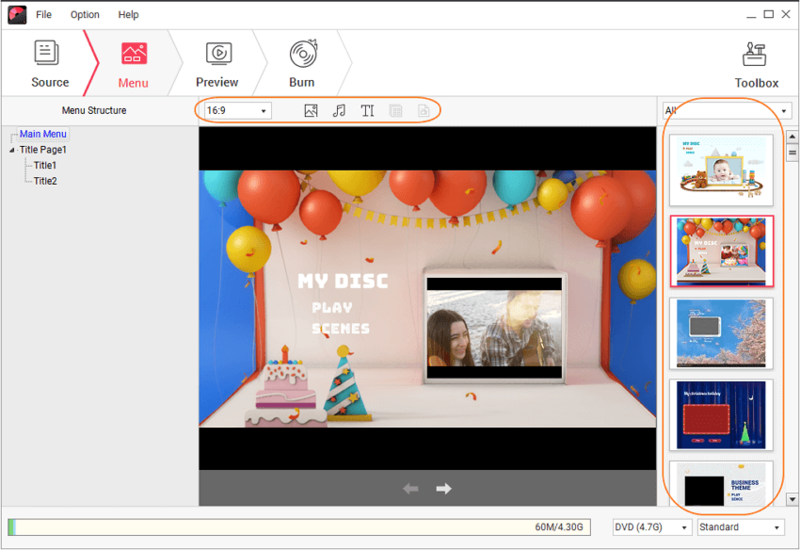 Wondershare DVD Creator is an all-in-one tool to help you burn videos and photos in any format to Blu-ray disc. It supports main videos formats such as MP4/MOV/AVI/MKV and more, and it has built-in video editing tool so that you can create your Blu-ray videos by cropping, trimming, adding watermarks, and so on. What's more, Wondershare Blu-ray video creator provides you additional functions such as burning photos to slideshow and one-click to burn Blu-ray disc. Burn videos in any format such as MP4/MOV/AVI to Blu-ray disc easily. Edit Blu-ray videos with built-in editing tools such as crop/trim/subtitle/watermark/effect. Provide 100+ free Blu-ray disc menu templates with Nature, Family Life, Travel, and more themes. Customize Blu-ray disc menu further with background image, background music, text, subtitle, and more. Additional toolbox to burn videos to Blu-ray by one-click, burning photos to Blu-ray slideshow, copy DVD, convert DVD to video, etc. Convert videos to Blu-ray disc in a super fast way and high-quality output. Follow the steps below to know how to create Blu-ray videos with features on Windows/Mac. At the very beginning, you need to download, install, and launch Wondershare Blu-ray video creator. Choose Create a Blu-ray(BDMV) Disc option on the main interface. You'll come to the interface under the Source tab and click on the " + " icon to open the search window and add your desired videos. You can also simply drag and drop video files present on your computer to the program to import them. If you want to make any adjustment on your Blu-ray videos, just click the pencil-like icon on the thumbnail to open the Video Editor window, where you can crop, trim, and rotate your videos, also add watermark or video effects, edit subtitle and more others. Wondershare Blu-ray video burner provides you 100+ free menu templates from Travel to Family Life theme. Move to the Menu tab to select your favorite templates design from the right panel. You can make further customization on your Blu-ray Disc menu like changing background pictures or music, editing disc name, creating chapters and others, click the related icons upon the active window to achieve. Before you burn your created videos to Blu-ray Disc, you can go to the Preview tab to check your creation. You're allowed to go back to make changes if something here you're not satisfied. Finally, click the Burn tab and select Burn to disc option to burn videos to Blu-ray disc, or you can choose to Save as BDMV folder option to save your Blu-ray video on your computer. Finish Burn Settings it asked including Disc Label, TV Standard, Burner, etc. and finally click Burn button to start burning videos to Blu-ray Disc. After a few minutes, your videos will be burned into Blu-ray disc and you can play it on any playable devices such as TV, Windows, Mac, and others. To make sure a better quality of your Blu-ray videos, please follow the steps and tips above and choose Fit to disc option at the finial step. Download Wondershare DVD Creator and try to create a Blu-ray video disc.